True Bliss Activate brain pathways you never even knew existed! Modify geometry and experience a gaming genre that is truly unique, different, beautiful and serene all in one. For all you mathematicians out there this will satisfy all your geometric vectoring desires in a way they have never been satisfied before. A vast library of shapes to play with - Make it live! Make it Connected! 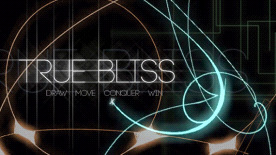 True Bliss has been designed and developed (including the in-game music) by Artur Mandas, a graduate of the Warsaw School of Economics in Poland. Artur was also part of the team behind the Oscar nominated short movie ‘The Game’. In addition, he is an award winning technical author.